Done for the day. I am taking a break from trading next week. 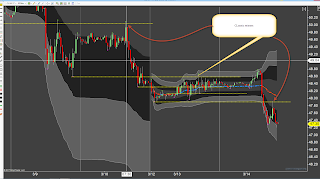 Its fair week here and my kiddo is off school plus its likely I will start my new mortgage career next week as well....so I am giving myself plenty of room for error and not trading. Besides I am tired of losing for a while. Time to clear the head. 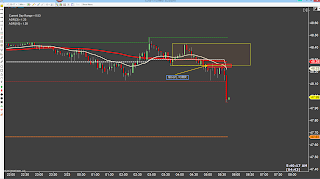 Except this.....If I miss something like the spike up, I tend to begin looking to manufacture something and since I know the 5M will take a long time to manifest a set up, I have taken to dropping down to the lower time frames to "find" something worth trading. This has resulted in losses nearly 100% of the time. I just figured this out today. (STUPID STUPID STUPID)....So I closed the one minute chart never to reopen. 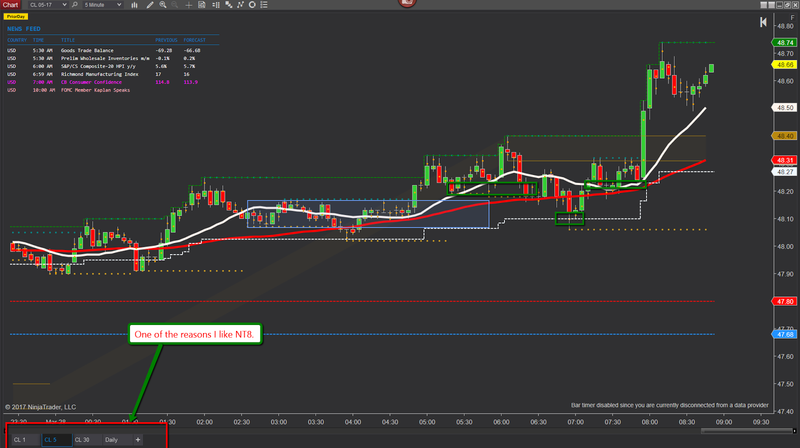 And found the nice little trade I made my losses up with. Time to make some breakfast. I slept in today since last night we went to see Ben Hur at the theater. We'd never seen it all the way through. I thought it was a 2 hour movie, turns out it was almost 4 hours. Got home at 11:30 last night, in bed by midnight which means I got shorted 3 hours of sleep for this mornings trading session. So I slept in. 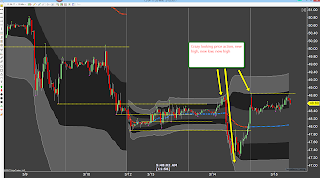 Got to the charts just after inventory and the chart tell the rest of the story. 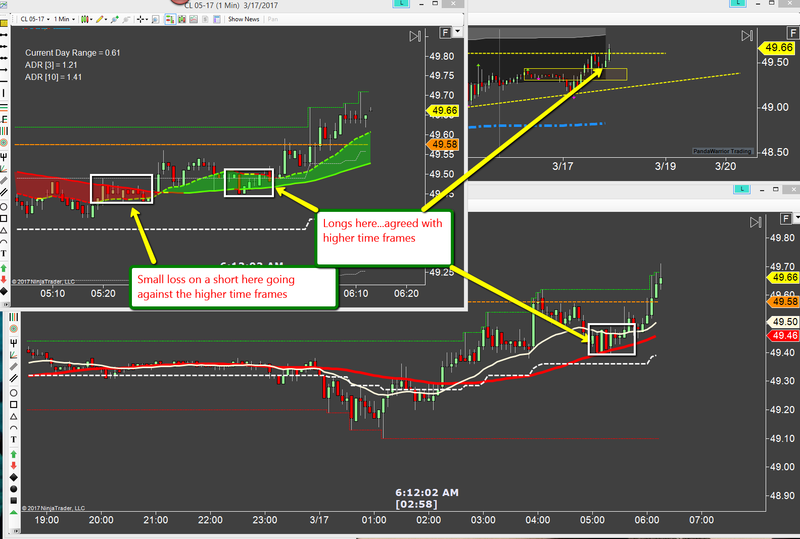 Tiny risk so able to size up a bit on the entry. 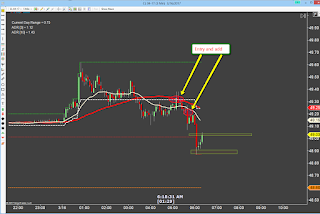 I think it was great location on a "normal" day but the buyers kept coming in and pushing the price up....I moved to BE at one point but that is not part of my overall trade management plan so I took the stop. 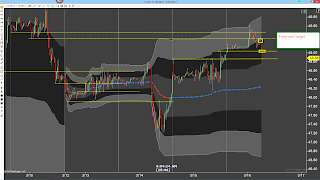 One and done as there was no good long entry location available after the inventory spike. And then, I bought one last time in the last green box. 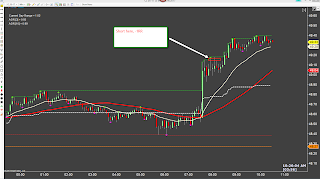 I held it for what seemed like way to long considering it sure looked like it should take off right away....and finally I decided it wasn't going to and bailed for a tiny winner....only to see it blast off on the NEXT bar. To say I was pissed was an understatement. This doesn't happen to me near as much as it used to but it still happens enough that I should have figured out something by now, as long as the trade premise is valid, just hold it.....but sitting there watching it fart around drove me nuts today....lots of five minute bars with less than 10 tick ranges....it can be infuriating. Once it blasted off, I knew better than to sit there and try to find another trade. I'd trade out of anger and boredom and that is an account killer. So I just walked away. On another note, I'm probably only about 2-3 more days from abandoning my NT8 experiment. I like it overall but small fonts and lack of a couple of tools I use is renders it less than optimal. I'm giving it to Friday and then probably back to NT7 for next week. Support becomes resistance. Classic TA. Most of the time it works. Sometimes it doesn't like yesterday. Today, it was super simple. Small risk, large target. Stay sane and solvent that way. Another scratch day....So strange this game we play. So much of what we do it not mechanical or rules driven but instead is emotional or mental. Our rational self knows what to do and yet the monkey brain interferes so often it feels as though the monkey brain is our true self. 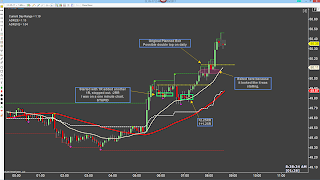 Still, doing the right thing is the only way to make money and so the pursuit of rational trading continues. I left money on the table with the last trade. 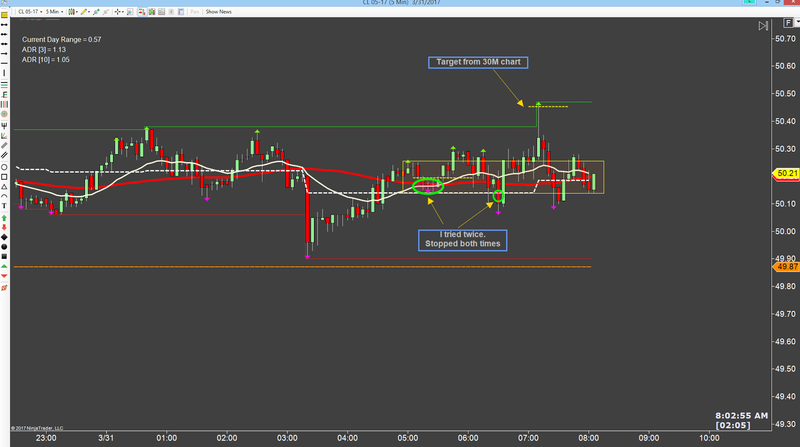 Quite a lot of it actually but I had no premise below the LOD which meant I exited that last trade a few ticks before the support area. 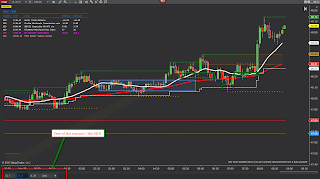 That orange line is yesterday's 50% level. So far, quite a bit of support there over multiple attempts so reasonable to exit there. Time to pack it in. I'm having coffee with my last surviving uncle on my mom's side of the family. He and my father were quite close and he called yesterday and wanted to chat. I suspect he's missing my dad pretty bad. Anyway, looking forward to seeing him again. After far to many trades today.....I ended up $35 after commissions. 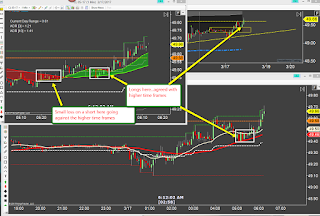 Honestly, it wasn't that frustrating, I was following my 30M chart around like a puppy taking trades on the 1M chart....but the premise of each trade included far to much assumed follow through which ended up killing a lot of trades at BE....along with a couple of losers and decent winners....all of which offset each other. 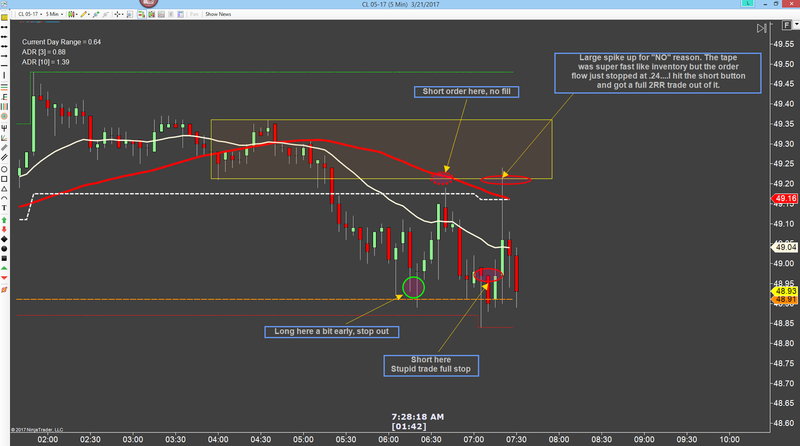 This is the five minute chart which shows the levels I was watching. Trouble here is this, Had I just traded only the 5M chart, I would have been in the correct longs with no shorts. I'm shaking my head at the inconsistency of the market these last few weeks. Headed out for coffee with some friends. Grateful this week is over. I'm down about 1.5RR for the week due to some sizing issues on a couple of losers. Otherwise it would be a scratch week. Today I took a small loser on a short followed by a winner long....then a loser long followed by a winner short. Next week more focus on just following the process, sticking with the smaller chart until the ranges open up again. Time to pack it in and enjoy the weekend. Take a look at this chart, what the hell kind of price action is this.....chop chop chop, new high, new low, new high....chop chop chop...then new low, new high, new low and now it looks like a new high is coming....un-tradeable unless you trade the absolute extreme. I even tried going to a lower time frame to day and that worked sorta of....but not really. I think I am done for a few days until this chop crap is over. I'll watch the market for sure but I'm not trading it again until "normal" price action resumes. No sense in killing my account like this. I'm either getting lazy, bored or something. 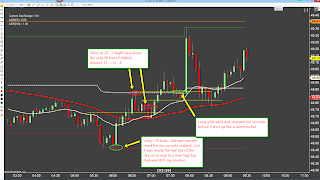 I have my normal way of looking at the market movement and I also have a higher time frame way of looking at bigger picture trades. And I've been missing them like crazy. Take a look at this chart. 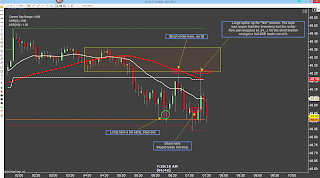 The market leaves clues where it wants to go and where it wants to turn. I've missed all three of these whilst trying to manufacture something out of the crap price action we've had lately. Perhaps a renewed focus on due diligence each morning is in order. 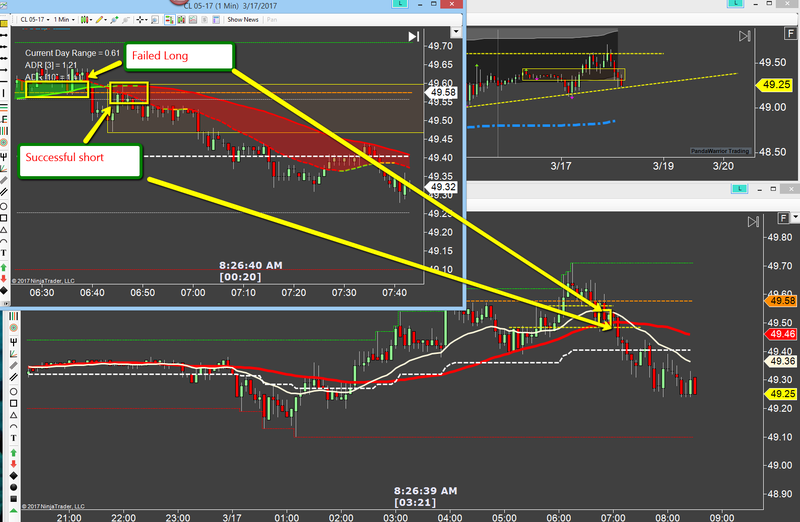 Then I sold 49.51 quite a bit later, stopped to the tick, Down 2.5RR. 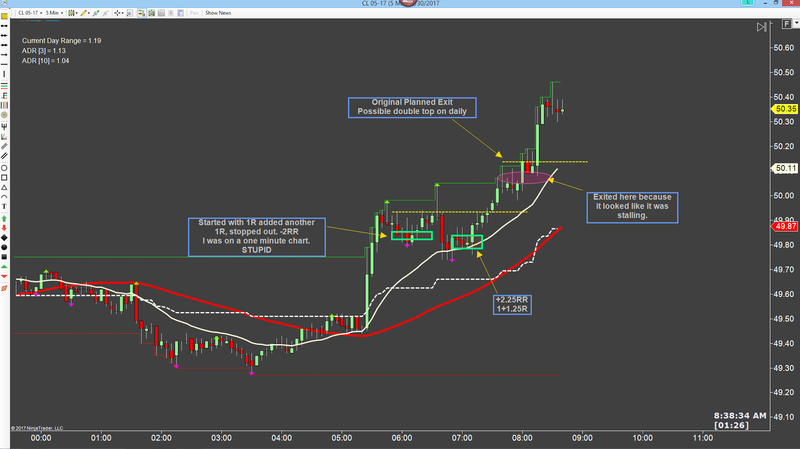 Finally sold again held for 2.5R gain and closed out as I ran out of time for trading. 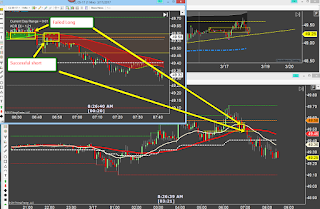 Original short target was 49.80 which it finally reached. 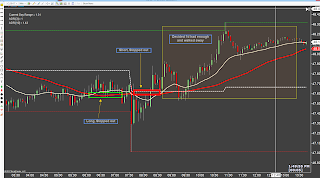 BAD execution today, good ideas with poor execution nearly always results in losses. I'm lucky to scratch today. I came down with a tremendous sinus infection yesterday and I took some meds last night to kill the infection but it didn't sit well on my stomach. Anyway, I spent the night in the bathroom puking my guts out, (second time in a week) and was totally exhausted this morning. It's 4:30PM and I'm just now starting to feel a wee bit better. My head feels like its gonna explode. I have a history of these sinus infections but this is the worst one I've ever had. 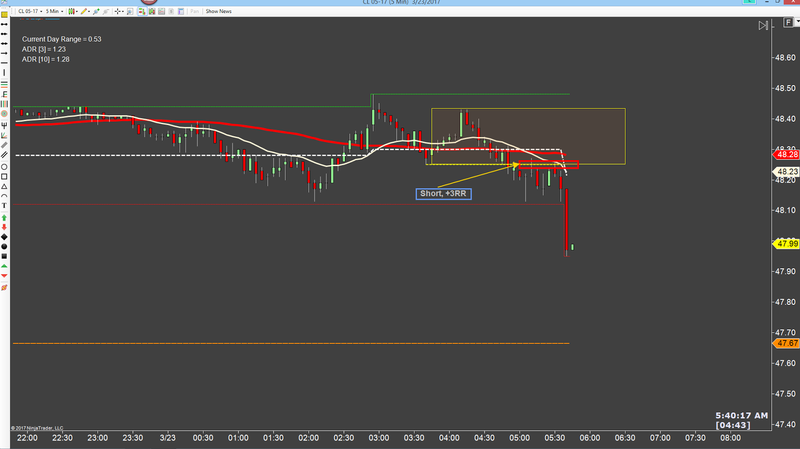 I might not trade tomorrow either depending on how I feel. I started a different antibiotic today and hopefully it will kick in tonight and take some of the pressure off. 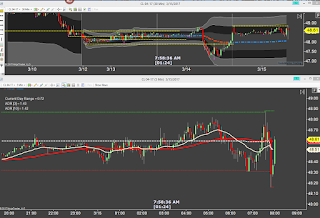 I had a family emergency come up yesterday morning around 6AM which meant I was unable to trade. 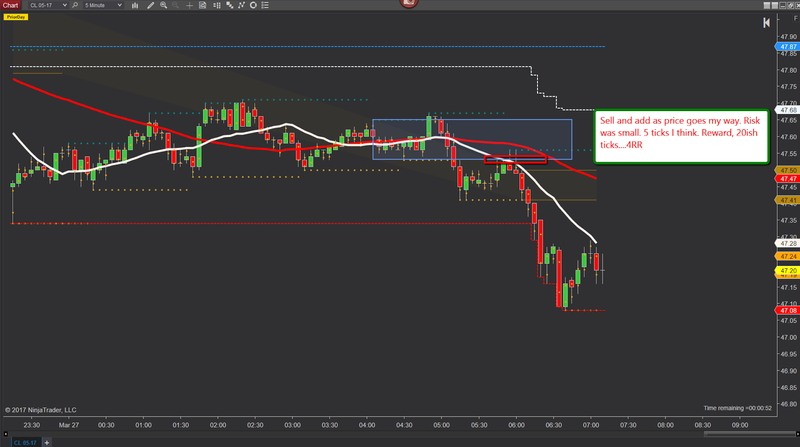 I had been at the charts for about 30-45 minutes when this happened but hadn't put a trade on even though a set up happened. 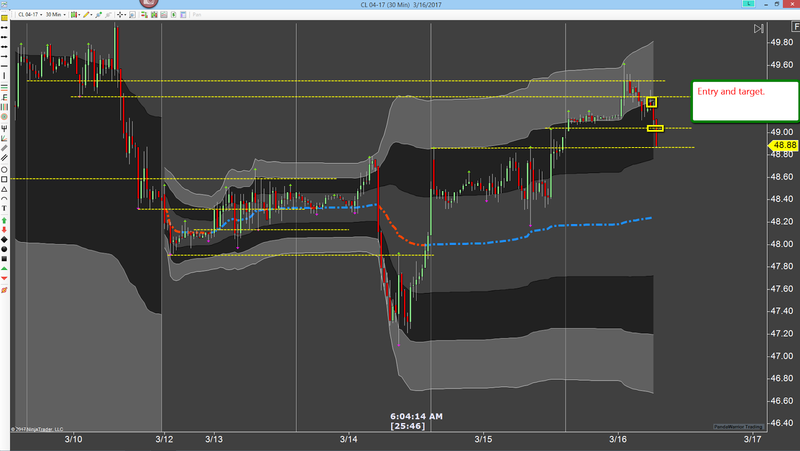 I just didn't like the way it looked combined with the low volatility lately, just made me nervous so I passed. Turned out it would have been a good winner but thats the way it works out sometimes. 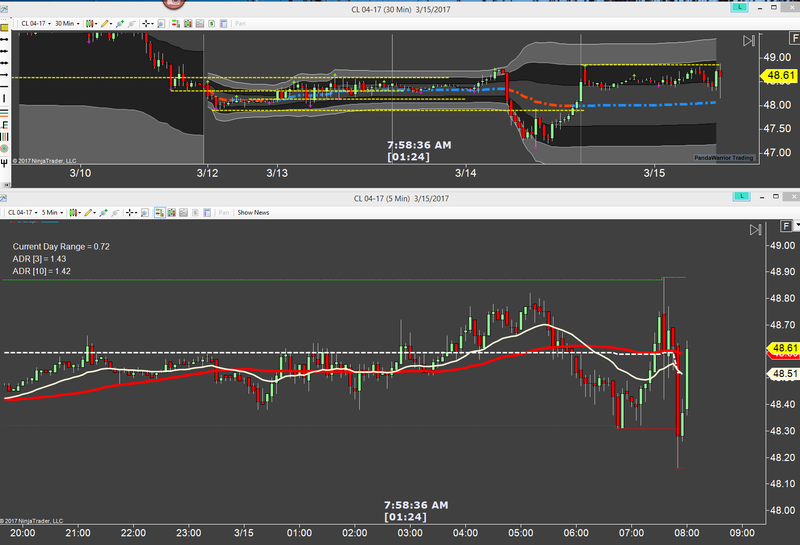 Today the range is only 37 ticks from high to low, its inventory day and so I think I shall sit this one out. Well sometimes it just doesn't work. 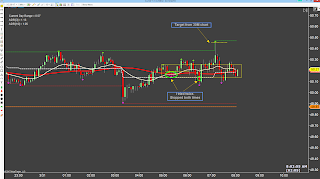 Everything was looking short but only the longs worked today. 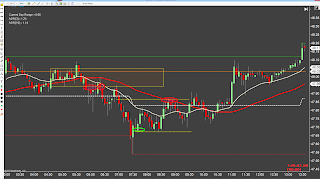 Not sure if my weakened state clouded my ability to see things differently but even after the longs were working, I didn't see a way I could have seen it any differently so no longs for me today. After nearly 2 months of no losing days, I was bound to have some draw down. I've been wondering when it would happen. Thankfully it ended in a break even week. I can handle that I think. Hopefully by Monday next week I'll be completely over this food poisoning thing. I'm still pretty weak and my entire upper body feels like its been used as a punching bag. I'm pretty sore. Have a big weekend planned this week. A birthday party tonight with dear friends, Midnight at the Oasis tomorrow with a Queen tribute band I'm looking forward to and then my wife is signing at church on Sunday. I do the live sound when she sings but I didn't make it to practice due to the food poison so someone else is doing that then a full afternoon of doing nothing. Time to hit the publish button and take off. 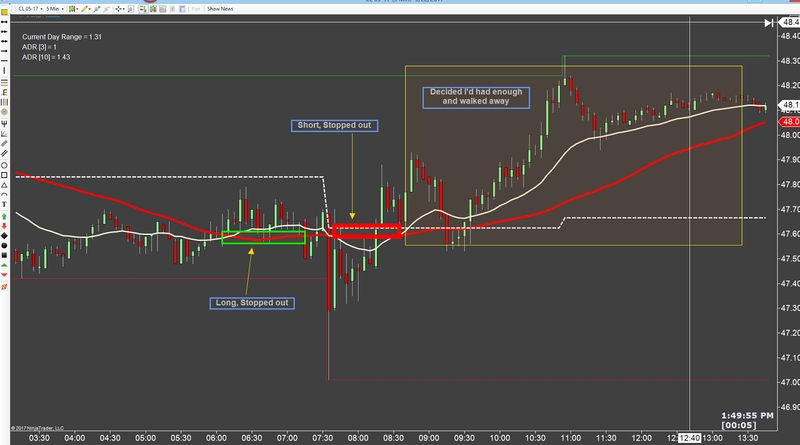 On the other hand, today was a perfect day for my style of trading. To bad I missed it. I forgot it was inventory until just before the number...by then I was down 1RR with a long in progress. I closed it out with .5RR profit just before the number and counted it lucky to be out with such a small loss. I have a test review today and the final exam due before the 10th of March and I will be done with school!!!. Looking forward to it like I haven't looked forward to anything in a long time.